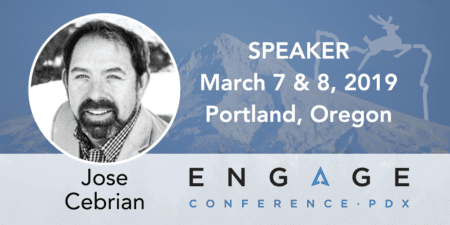 Jose Cebrian will be speaking on The Marketing Funnel at Engage which will take place March 7–8 in Portland Oregon. For more information or to purchase tickets, please click here. I lead the CRM strategy practice at Merkle, which means that I help our clients use people-based-marketing (PBM) to enhance the customer experience and show the value of their data assets for their companies. Prior to this role, I have run the email marketing practice at Merkle as well as the global email services team at Acxiom. Before I got into email, I worked in technology-related consulting at Gartner and digital marketing at AGENCY.COM. 2) How should a business conceptualize the creation of a new conversion funnel? What we are seeing is that we need to look at the conversion funnel differently. The short answer is that isn’t a straight line -it’s a lot wider and more complicated. While yes, there are still some very clear low funnel triggers to act on such as search for, say a new basketball, that I can transact immediately, the interrelation of all of a company’s interactions with a prospect or customer ultimately play into the conversion funnel itself. And I think they need to consider how they work together. A way to conceptualize this is to draw a map of customer touchpoints (not a journey) where one can see how a company’s products are bought and used. So for a home electronics company, you have stores, distributors, the homes, websites and then identify how different media connect to create the experience to bring in new customers, reinforce messaging, convert, and drive to additional purchases. With this, you can focus on the key intersections to influence and then optimize those touch points to drive a conversion. 3) In what situations would you un-gate valuable content that might be used as part of a sales funnel? Valuable content is an important part of how people see your brand so I would generally advocate for ungating it when you know who the person is already – an email subscriber or registered visitor – because in many cases the reason you gate the content is to get first-party data. If you already have it, you can still acknowledge the interaction with that content. If the content is paid for, however, as in a news site, the issue is one about business model and how you want to balance ads vs. paid subs and that a tougher nut to crack without more context.